Network diagrams are essential for companies to aid in administration and to have good documentation if staff change. Network diagrams are not only for large companies and www.ratemynetworkdiagram.com allows users to post images of their own home networks and then let other users rate them. It is amazing to see how much equipment some people have. 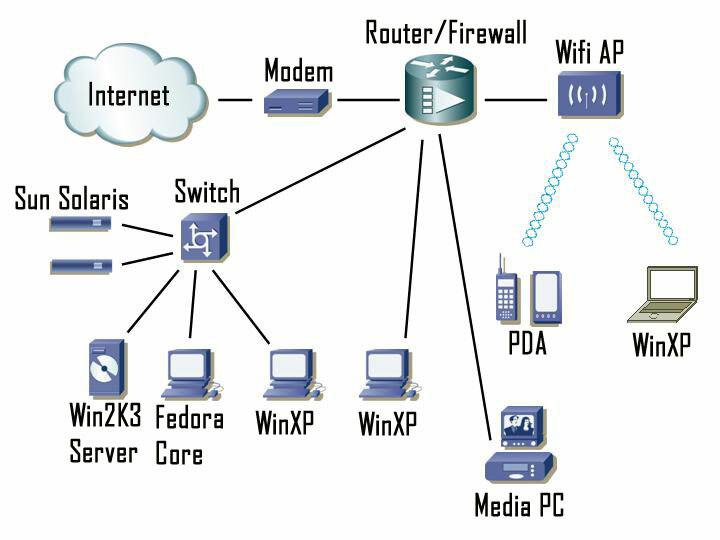 Talking about having a lot of equipment look at the diagram below to see my home network. It is just a quick diagram and I plan to add more information at a later date. I used icons from the Cisco site under Powerpoint icons. As a Network Manager or an aspiring one there are certain rules or laws that you must live by. If you do not, you can suffer terrible consequences, like data loss, loss of your time trying to rebuild the network and worse of all loss of your job. NewsForge.com has a good article explaining ‘The Ten Commandments of system administration’ which is well worth reading, memorising and living by. Having enjoyed watching the new online tech videos that are available from FromTheShadows.tv and Systm.org I have been looking in to video editing software. Initially I have be using Windows Movie Maker to produce video's but it is a very basic application and if you can't afford the high end applications like Adobe Premiere Pro then you need to find something in between. One video editing software that offers a free version is from Avid Free DV, I have yet to try it as I am currently experimenting with the trial version of Adobe Premiere Pro. You can expect to see some 'Tech Video's' released from syndicateONE.net soon. Systm.org showed you in their second episode how to run free PVR software on Linux. If you do not want to switch to Linux and are happier with Window XP then MediaPortal - The ultimate HTPC / mediacenter could be your free answer. "MediaPortal turns your PC in a very advanced Multi-Media Center / HTPC. It allows you to listen to your favorite music & radio, watch your video's and DVD's, view, schedule and record live TV and much more." In my opinion the Divx video compression codec has completely changed the way video can be watched and especially distributed. DivX Networks is aiming to improve quality and features even more with its new Divx 6 video files and Divx Media Format. 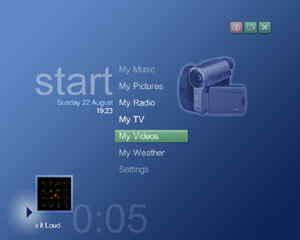 Divx is not only restricted to computers but is now found in lots of Consumer Electronics devices which opens the possibilities of the format even more, taking it from the computer desk to the sofa. Read Tom's Hardware Guide review of the release.